NICVA held a conference on the EU Referendum to inform the VCSE sector on the primary arguments for and against leaving the EU. 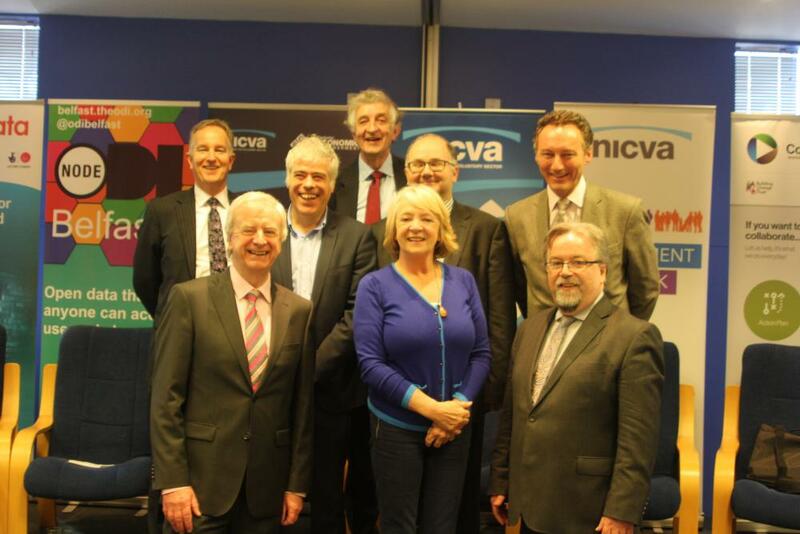 Seamus McKee (BBC Broadcaster) chaired the conference and welcomed delegates to NICVA. Seamus set the tone for the day by asking attendees to think about recent EU referendum headlines from both sides of the debate. Seamus McAleavey, Chief Executive of NICVA, provided a presentation on what has the EU ever done for the sector. Seamus stated that the big issues contained within the EU question needed due consideration and it was crucial that each voter’s ideological position was informed. He outlined the historical context of the EU structural funds provided to the region and the amount the sector had received so far. These were designed to balance out the issues Northern Ireland (NI) had with being a region on the periphery of the EU in a post conflict transition. Seamus stated that the EU had played a huge role in supporting the peace process and recognised the significant importance civil society plays in peace and reconciliation through the PEACE funding made available. He again stressed the importance of voters informing themselves before voting on the 23rd June. Frances McCandless, Chief Executive Charity Commission NI, provided a presentation to delegates for organisations planning on campaigning on the referendum. The Charity Commission NI issued guidance on this issue which Frances urged organisations to read thoroughly if considering a position. The Transparency of Lobbying, Non-party Campaigning and Trade Union Administration Act 2014 Act changed how charities can campaign in referendums and elections. For more information on the Act and how it affects your organisation, see the NICVA Lobbying Act – 10 things to know article. Bill White, Chief Executive of Lucid Talk, provided delegates with a presentation on how referenda/referendums work. Bill outlined the importance of the question and how lessons were learnt from the Scottish Referendum in the yes/no responses provided. Bill also considered when is a win, a win? What will be considered a majority in the referendum vote? He argued that the onus is always on the status quo to perform better and that the ‘remain camp’ needed at least 60% to really ‘win’. Lucid Talk, as one of Northern Ireland’s major polling companies, had been conducting polls on the referendum and how different demographics are likely to vote. Leave voters are likely to be: male, Unionist/Loyalist, working class, urban dwelling and in the 45+ age group. Remain voters are likely to be: female, Nationalist/Republican or Alliance/Green, middle class, rural dwelling and in the 18-44 age group. Bill stressed that there were still a significant number of voters that were undecided as to how they would vote. Bill undertook some polling on behalf of NICVA asking the EU Referendum question and asking delegates to rank their reasons for voting in the way they did. We were delighted to have six contributors to the afternoon’s debate on the EU referendum. Arguing to remain in the EU we welcomed Anthony Soares, Centre for Cross Border Studies; David Gavaghan, CBI; Jane Morrice, Member of the European Economic and Social Committee; and Lee McGowan, Queens University. Arguing to leave the EU, we welcomed Graham Gudgin, Cambridge University; and Jeffrey Peel, Quadriga Consulting. Seamus McKee chaired the debate and asked for contributions along the same lines as the reasons delegates were asked to rank. This included: the economy; the movement of people and labour; the contributions NI gives and receives from the EU; EU funding; and the policy priorities of the EU. Each participant was asked to provide a two minute opening answer to the question: ‘what is your position on the EU and why’. Jane Morrice focused on the historical context of the establishment of the EU and the principles on which it was based. She discussed Northern Ireland’s relationship with the EU in the context of our conflict stating that the EU had always been financially supportive in maintaining the peace process. Jeffrey Peel was next and he identified himself as someone who believes in small government. Jeff stated that the EU was the worst example of big government with 25,000 civil servants and a wasteful approach to public spending. He told attendees that £8.5billion was the difference in what we provide to the EU compared with what we receive. Anthony Soares focused on how the EU helps a small region on the periphery of Europe to achieve our ambitions. He told delegates that the EU allows and fosters collaboration across a continent on the key issues that matter. The EU supports the voluntary and community sector to be more prosperous and out-looking in our work. Lee McGowan focused on the political aspects of EU membership and how little information the British government has provided citizens with what the EU is. Graham Gudgin identified as a Eurosceptic and stated that it had arrived at this position following years of evaluating EU grant schemes and being on the receiving end of them. He stated that a good government should not be outsourcing cheap labour and skills and good policy would be focusing on the country’s own economic workforce. Graham told delegates that in the worst case scenario, NI would be 29% worse off over the next number of years than 27% if we remained in. David Gavaghan stated that within the EU, Britain could be a maker of decisions and sat at the table when vital decisions were being made which would affect our economy. He stated that the EU market was the richest in the world and having influence over decisions affecting it and unfettered access to it was imperative for growth. A portion of the debate focused on whether, in the context of a ‘Brexit’, whether EU policy priorities would be adopted by the UK government and the NI Executive. Graham and Jeff argued that if a programme or priority was of merit, then government should and would likely continue to fund it. Graham argued in defence of democracy and as a nation of tax payers, we alone should have a say over how our tax revenue is spent. Jeff added that the money we would have a say over would be greater given it escapes the “vast cost filtration” of the EU. Anthony posed the question that if the UK did exit, would the UK government continue to commit to cross border studies and cooperation? Anthony was not optimistic. An input from the floor added that there was very little trust in Stormont and the EU provides an excellent challenge to the NI Assembly’s priorities. The EU has prioritised funding for employment opportunities and training for some of the hardest to reach groups in the region for years. The contribution from the floor was not convinced this would be continued by the NI Assembly. Lee added that democracy sceptics forget that the EU is its 28 member states; the states develop the policy and the EU Commission implements them. Two policy areas which arose as other examples were environmental directives and human rights legislation. A significant portion of the debate focused on the impact on the economy of a leave outcome. The remain debaters argued that we do not know what a leave result would look like with a harsh exit costing up to £100bn from the UK economy. David Gavaghan clarified that this was in loss of trade. He added that the factors that matter the most to business was market stability and market access to the world’s richest trading block. These two factors would be hugely affected by an EU exit. When asked about the cost vs benefit of EU membership, a PwC study commissioned by CBI showed that a soft exit cost per household would be £2100 whilst a hard exit cost would be £3700. On the subject of the movement of people and labour, the remain contributors argued that an EU exit would have huge implications not only on those wishing to come here, but for us moving across Europe and accessing services. Anthony argued that the EU referendum debate was fundamentally selfish and we didn’t think about how a ‘Brexit’ would impact on the rest of the EU. Finally, Seamus asked each of the debaters to state the most important reason on which voters should base their decision on. David replied that voters should consider the impact on jobs, peace and that the UK should remain a maker rather than a taker. Graham responded with trade and migration. He stated it was important for voters to remember that trade would continue to happen freely with the EU as it was in everyone’s best interests. He also posed the question whether cheap labour migration as it is currently stands was the best way to run a country. Lee challenged voters on the concept of sovereignty asking whether it truly existed. He stated that the UK was stronger on the global stage within the EU than outside of it. Anthony responded that this was a largely ideological decision and we must consider whether Northern Ireland is capable of achieving its ambitions outside of the EU. Jeff argued that trade and self-reliance was the main factor that should affect people voting and that if our reasons for not exiting was about government accountability, it was our responsibility to hold our own government to account. Jane finished by naming the principles on which the EU was established in the first place: peace, respect, tolerance and the promotion of democracy to name a few. She urged voters to consider culture as it is something that is so rarely touched upon within the ‘Brexit’ debate. So, what actually happened in the Brexit process this week? What happens to data flows after a no deal Brexit? How will Brexit impact the ethnic minority sector? UK-EU Brexit Deal…. What are the details? Theresa May Brexit Speech – What did we learn? Finance Minister comments on EU referendum meeting with NICVA, Business and Trade Unions. NICVA Update on EU Referendum. Where does Brexit leave charities in terms of continued or future EU funding? Why is NICVA supporting In?